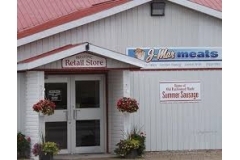 J-Mar meats is located 5 minutes from Mount Forest on Grey road 109 RR#3 Mount Forest. See the professional and friendly team at J-mar for all of your custom meat orders ans well as you barbecue and dinner needs. This facility specializes in custom smoked pork and beef and also offers an array of retail meat selections to suit your individual needs.